College Football: Who could the Giants be watching between Clemson and NC State? We have a trio of big games this weekend, who could the Giants be watching? Can you believe that it is already week 10 of the College Football season? But the silver lining to this part of the season is that we have plenty of conference rivalry games — Which usually means a lot of players to watch from a draft perspective. This week we have two of the biggest rivalry games of the year and one game we know that the New York Giants will be attending. So without further ado, let’s dive in. I always like to highlight games that the Giants officially attend, and per Chase Goodbread of College Football 24/7, the Giants have a credentialed scout in attendance at this game. 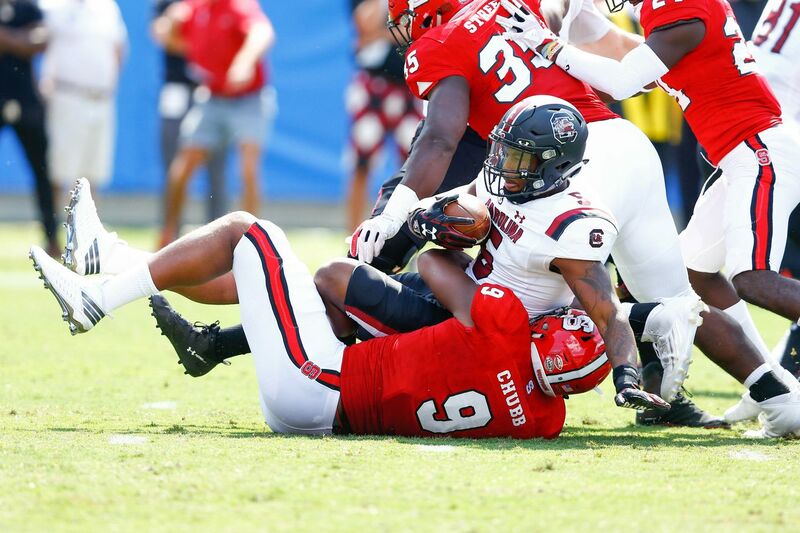 We already know that between the NC State (Bradley Chubb, Kentavious Street, B.J. Hill, Justin Jones, Darian Roseboro) and Clemson (Clelin Ferrell, Christian Wilkins, Dexter Lawrence, Austin Bryant), this game will feature oodles of Defensive line talent. The concentration will be on Wilkins, Chubb, and Ferrell, but these defensive lines are littered with talented players. So I want to concentrate on the two left tackles in the game. NC State left tackle Tyler Jones is very undersized for the position at the NFL level, listed at just 6’3”, 300 pounds, but he is an exceptional pass protector. Despite facing good pass rushes in 2016, he allowed just one sack in eleven (11) games. He is probably a guard at the NFL level, but guards with “left tackle” feet are a rare commodity and tend to be good at the next level. On the Clemson side of things is Mitch Hyatt. With top OT prospects Connor Williams and Trey Adams going down to injury, Hyatt has started to garner more attention for himself, and he’s an intriguing prospect. A bit undersized himself at 6’5, 295 pounds, he is a balanced and athletic tackle who plays with savvy and aggression. The downside is that his (relatively) svelte build simply doesn’t give him the mass to deal with powerful defensive lineman. And while his technique and use of ankles appear solid, physics is what it is. At just 20 years old, he has plenty of time to grow, but it is unclear how much room his frame has for additional mass while keeping his athleticism. His match-up against the 6’4”, 270 pound wrecking ball that is Bradley Chubb could figure prominently in his draft evaluation. It should also be noted that the junior has been a starter each of the last three years, which includes two National Championship appearances, so he has played a lot of football for his age, and against the strongest competition. The “Bedlam” rivalry game between these two schools is usually one of the highlights of the college football schedule, and this year is no different. But with the Giants potentially drafting in the top five and potentially looking at quarterbacks, this game takes on additional importance. Of the quarterbacks we know to be in the 2018 draft, this game will feature two of the top three in Oklahoma’s Baker Mayfield and Oklahoma State’s Mason Rudolph (Lamar Jackson being the third). Personally I rate Mayfield higher due to his competitiveness, efficiency, and the mental improvement he has shown since returning for his senior season. However, Rudolph has the prototypical “NFL” build and there will be some who will always rate him higher because of that. Oklahoma State wide receiver James Washington isn’t a big prototypical “X” receiver like scouts like to drool over, but he could well wind up being one of the first receivers off the board come April. He plays bigger and faster than he will measure, with a knack for separating from defenders while using outstanding concentration and body control to make spectacular catches. Oklahoma offensive tackle Orlando Brown Junior is going to be a very interesting, and potentially difficult, evaluation. There are no two ways about it, he is an absolutely enormous, and enormously powerful, man. Brown is Listed at 6’8”, 345, and he definitely plays up to his size, and it’s usually all over once he gets his hands on a defender. Interestingly, he is surprisingly graceful for a player his size, smoothly moving in his kickslide. However, there have to be questions about his ability to translate at the next level. Because of his sheer size he can struggle with pad level, and athletic edge rushers will exploit that at the NFL level. He is also very limited when asked to play in space or pull. His kickslide is smooth, but he is very heavy footed and slow on the hoof. I have seen a few instances where he is asked to pull and the play is blown up while waiting for him to get into position. Brown might be schematically limited at the next level, and probably a player I will spend a lot of time watching in the coming months. It always has to be mentioned when these two teams throw down, and as usual there will be NFL players all over the field in this game. Alabama cornerback Minkah Fitzpatrick might be the player to really keep your eye on (it shouldn’t be tough, just watch the ball — he’s always around it) for the Giants. The team might have bigger needs elsewhere, but GMs can only control so much with respect to the draft, and which players are available when they pick is not one of those things. Fitzpatrick looks as though he will have all the requisite measurables to garner a high first round selection, and he is a bona fide playmaker on the defensive side of the ball. The Giants have invested heavily in their secondary of late, but given the age (and questions) of Dominique Rodgers-Cromartie and the attrition normally associated with the secondary, a talented and versatile DB can’t be out of the question. Up front, Alabama guard Ross Pierschbacher is the lineman to watch. As it stands, the Giants entire offensive interior is entering free agency except for John Jerry. They will likely have to make some difficult decisions, and adding to the unit in the draft almost seems like a given at this point. LSU defensive end Arden Key is shaping up to be something of a mystery. Physically, he has the tools and measurables to be regarded as future top-10 pick. He has outstanding length at 6’6” with long arms to match, but a wiry 255 pound build that gives him great bend as well. He is also a polished pass rusher with the speed and quicks to get home. However, there have been some questions about his mentality, and some draw comparisons to former Nebraska (and sometimes Dallas Cowboys) DE, Randy Gregory. Further complicating matters is Key’s lack of production this year, with just 3.5 sacks on the season. He has all the talent to be a top pass rushing prospect, but teams will have to answer the question of whether he has it between the ears. This game will also feature a trio of intriguing running backs in LSU’s Darius Guice, and Alabama’s Bo Scarborough and Damien Harris. Not to mention another potential top receiver in the explosive Calvin Ridley. As always, I think the best way to watch games like this is just to sit back and enjoy them, and make a note of which players jump off the screen at you.